1. The promoter of the contest is Journey to 100k. 2. By entering this contest, you agree to and understand that prize value is subject to change, we hold the right to remove/disqualify contest participants at any time for any reason. Cryptocurrency is volatile and you should do your own research before investing in any cryptocurrency in this contest. 4. The approximate total prize value is $10,000+. 5. Contest begins on 4/12/2019 and ends on 5/10/2019. After this date there are no further entries permitted to the competition. The promoter reserves the right to change the beginning or end date. 6. No responsibility can be accepted for entries/points not received for whatever reason. 7. Contestants will get 10 extra entries/points into the contest whenever they refer another valid person into the contest. 11. 2 Winners will be chosen at random, however the more points/entries earned per participant the higher the chance of winning. 12. Top 100 participants with the most entries/points will receive prizes. Top 3 will receive larger prizes. 14. The winner will be notified by email within 10 days of the closing date with instructions on how to claim the prize. If the winner cannot be contacted or do not claim the prize within 7 days of notification, we reserve the right to withdraw the prize from the winner and pick a replacement winner or cancel the prize. 18. 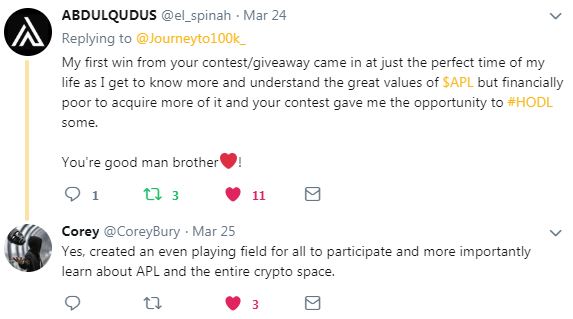 By entering in this competition, an entrant is indicating his/her agreement that Journeyto100k.org and all representatives/employees will not be held responsible for any investments made by entrant into any of the Cryptocurrency projects included in this contest. 19. The competition and these terms and conditions will be governed by United States law and any disputes will be subject to the exclusive jurisdiction of the courts of United States. 20. The winner agrees to the use of his/her name and image in any publicity material. Any personal data relating to the winner or any other entrants will be used solely in accordance with current USA data protection legislation and will not be disclosed to a third party without the entrant’s prior consent. 21. The winner’s name will be available within 10 days after closing date and announced on Journey to 100k YouTube channel and Twitter page. 22. 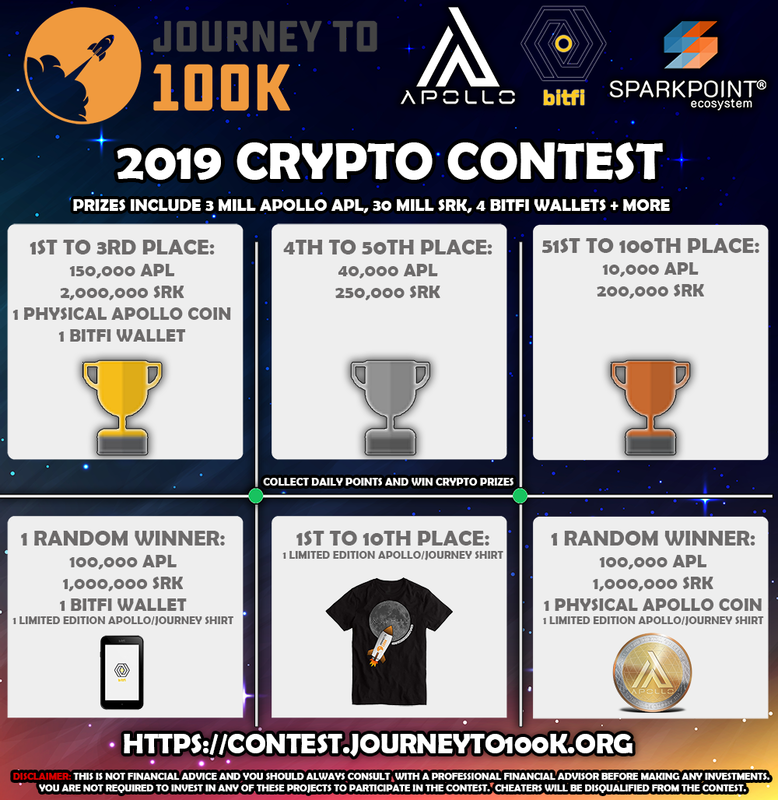 This contest/giveaway is sponsored by the following projects: Apollo Currency (APL), SparkPoint (SRK), Bitfi Hardware Wallet. Any investments made in these projects by entrants should be on their own terms and Promoter will not be held responsible for any investments made in these projects. Entrants are not required to make any purchases in these projects to participate in this contest. 24. This promotion is in no way sponsored, endorsed or administered by, or associated with, Facebook, Twitter or any other social network. You are providing your information to Journey to 100k and not to any other party. The information provided will be used in conjunction with the United States standard Privacy Policies. 25. We are not financial advisors, please do your own research and make your own investment decisions. 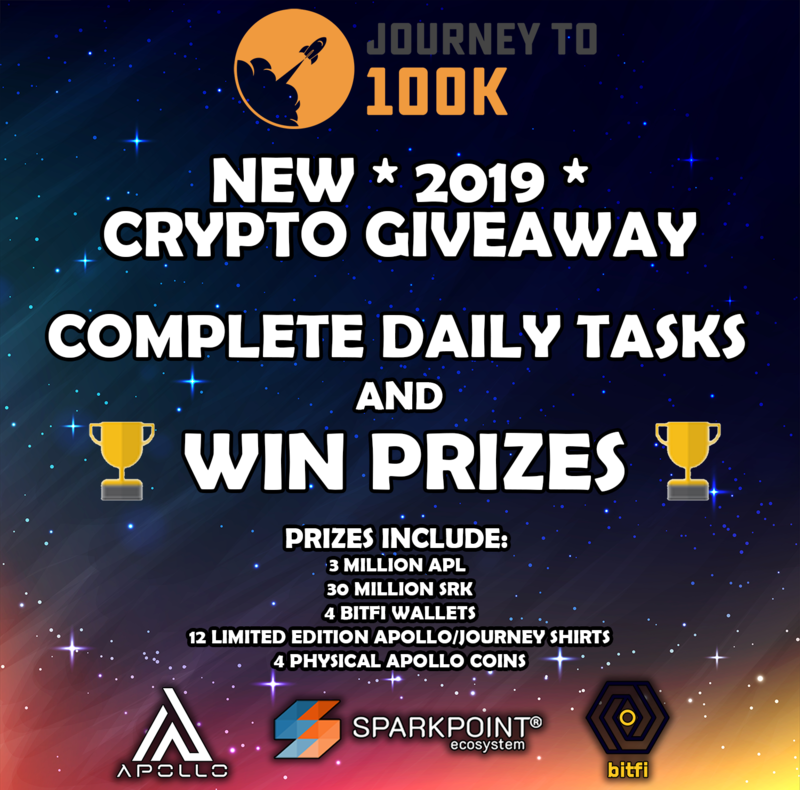 Over $10,000 of Cryptocurrency in prizes! Complete daily tasks(like sharing videos/tweets) and refer friends to earn more points and increase your rank in the competition to earn better rewards. Top 100 winners will receive big prizes and top 3 even bigger! IMPORTANT: Only one email per IP address can be used. In order to keep airdroppers and cheaters out, we have the auto disqualify enabled. If you accidentally get disqualified, you will have to sign up with a fresh email on a new IP. Make sure to always sign in using the email you made your account with. Don't create multiple accounts! Cheaters will automatically be disqualified from the contest! Disclaimer: I'm not a financial advisor and none of this should be taken as financial advice. You are not required to make any purchases in the sponsored projects. You should always do your own research and consult with a professional before making any investments. 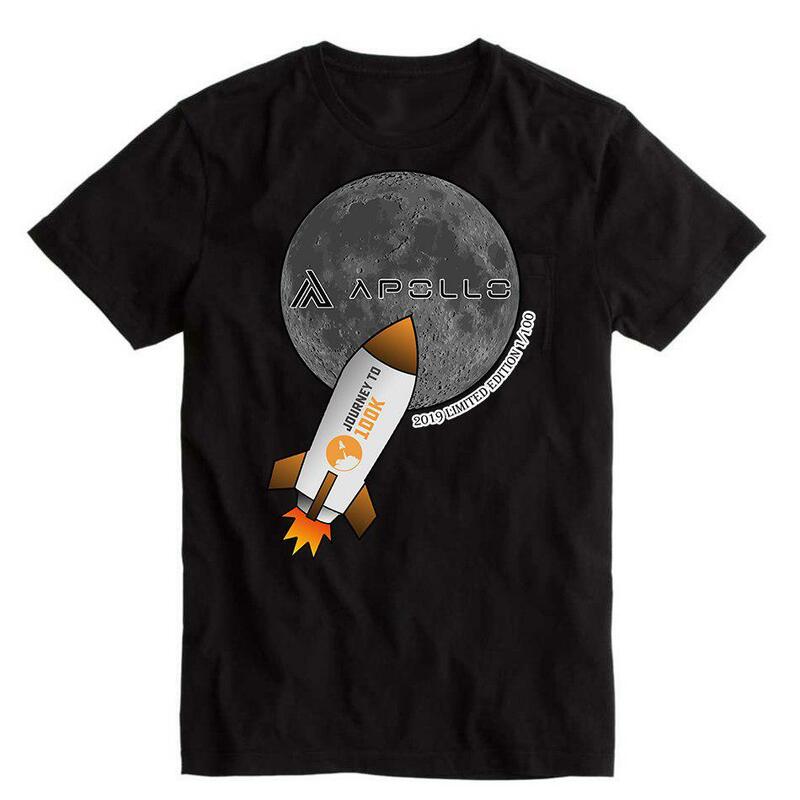 12 limited edition Journey/Apollo shirts will be prizes in this contest! 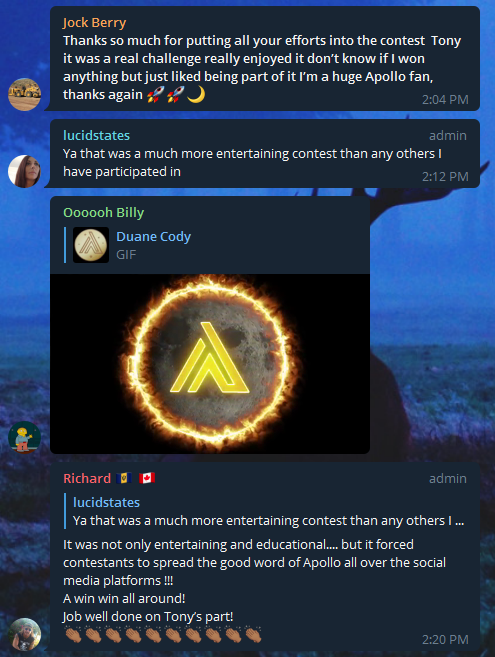 What's your Apollo Wallet ID? What's your ERC20 Wallet ID?